When students and faculty return to the ISU campus for the spring semester, they'll find a new place to buy coffee and snacks in the Scott College of Business. And those serving up the food and beverages will be volunteering their time to do it. 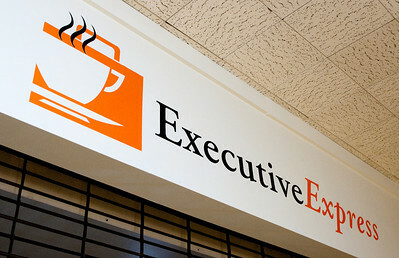 The Executive Express is a unique twist on a student-run food service operation. As proposed, there will be only two formal employees of the operation: a general manager and an assistant manager that are yet to be named. Much of the work will be completed by students associated with 10 of ISU's business fraternities and associations who will volunteer their time to sell food and drinks. In exchange, they'll receive a portion of the monthly net proceeds for their organizations. The unique business plan is one that grew out of Assistant Professor of management David Robinson's senior business experience class, and it has been a couple of years in the making. The idea was prompted by College of Business Associate Dean Bruce McLaren who suggested the class study the feasibility of opening a student-run food service operation after Sodexo - the university's contracted dining service provider - made the decision to close one of its Sub Connection campus locations, Robinson said. Sodexo Regional District Manager Sue Sluyter said even though the Sub Connection had been popular during the 10 years it been housed in the College of Business, the College of Education's move out of the towers prompted Sodexo to close the eatery. Sluyter said she's confident that was the right decision. "Food service is like a pie," Sluyter said. With all of the eateries on campus struggling to meet the needs of a limited number of consumers, "we didn't want to divide the pie of food service dollars even farther." While Sluyter was convinced she made the right decision for her organization, she encouraged leaders within the College of Business to consider the possibility of a student-run eatery. That's where Robinson and his students entered the picture. The coursework in Robinson's class has traditionally centered upon providing consultations for small businesses or not-for-profit agencies that need assistance in understanding the external and internal factors that affect the operation. "We give them ... almost a physical exam of their strategy," Robinson said. But Robinson had never before conducted the class in a way that allowed the students to become their own client. "We thought ... if anyone's going to start a business to fill that niche, why not have it be us," he said. "I thought it would be a good test of our skills to actually see if we could do a startup." So throughout the fall semester, a team of 10 students undertook the task of getting Executive Express up and running. They first sought advice from Sluyter, then they surveyed more than 200 students and faculty to determine their food and drink preferences. They met with coffee vendors to select the perfect product. They cleaned and rearranged and contracted site renovations. They developed a logo. They created a marketing plan, and they even convinced President Dan Bradley to give them a $6,500 three-year loan to help with startup costs. 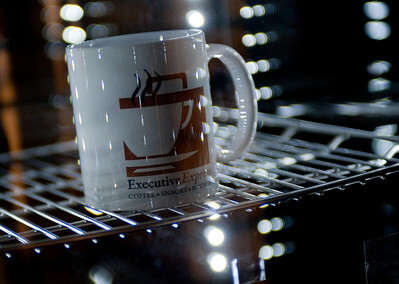 Then, in a test-run on Dec. 1, the students brewed and sold the first cup of Executive Express coffee. "We had this vision that we wanted to be open" by the end of the semester, said Arlo Daunhauer, the student team's leader and a senior business major from Huntingburg. "That was our measure of success ... and we did it." Now that the coffee and snack shop is ready to open for business, it is likely to face some of its greatest obstacles. The shop will be owned by Sycamore Business Advisors - technically an ISU senior experience course in and out of which students revolve every semester. Robinson acknowledges that the concept of volunteer labor may cause problems for the business after the excitement of the moment passes, but he said he's ready to have incoming students continue to address and perfect the business operation. "If the labor structure collapses, we've got some real issues to address," Robinson said. "But I think it's a good fit for now. If we end up struggling, all the better, because students will apply their business skills to solve the problems. We learn the most when solving real problems and the café becomes a living laboratory for our students." Whether the coffee shop succeeds or fails over the long-run, Daunhauer said nothing can take away from the sense of accomplishment his team has felt about getting Executive Express operational. "This will be one of the highlight moments of my college career," he said. "When I come back three or four years from now, I hope I'll see how it's grown into many different things. "If I come back and they're serving pizza, I'll be tickled to death," he said. The Executive Express will officially open for business on Jan. 19 with hours of operation Monday through Friday from 8 a.m. until 2 p.m. Contact: David Robinson, assistant professor of management, Scott College of Business, Indiana State University at 812-237-8829, or david.robinson@indstate.edu. Senior experience business students in Assistant Professor David Robinson's class spent the fall semester developing a coffee shop that will open in the Scott College of Business on Jan. 19.